Ask any shark enthusiast why they love sharks and you are likely to get a variety of responses, all of which struggle to capture the same elusive feeling of awe one has when a dorsal fin materializes out of the blue. It’s an addictive feeling that both excites with adrenaline and eventually calms with the appreciation of being together with one of nature’s oldest and most highly evolved creations. I am fortunate enough to have experienced the feeling many times before; however, none were quite like what I felt last week as I stared through my mask at 117 lemon sharks swirling around me in tight formation. They may have been small (the largest measuring 101 cm) and enclosed in a holding pen, but the recently tagged cohort of youngsters before me represented the future of this critical shark in The Bahamas in a very big way. 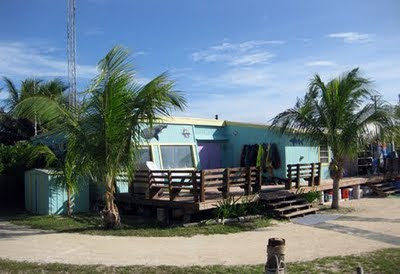 Welcome to the Bimini Biological Field Station (BBFS) in Bimini, Bahamas! 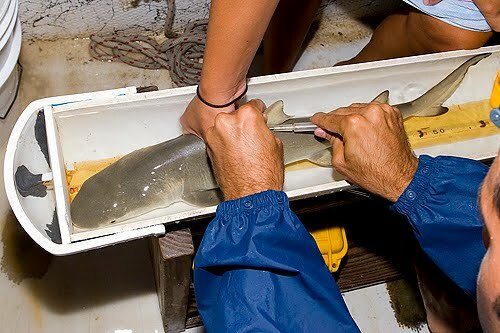 BBFS, commonly referred to as the “Sharklab”, has been researching lemon sharks (Negaprion brevirostris) in The Bahamas and Florida since 1990 when it was established by world-renowned shark biologist Professor Samuel “Doc” Gruber. Fed up with the hassle of working from research vessels in the Bahamas since the late 1970’s, Dr. Gruber opened the Sharklab to conduct fieldwork on a more continuous and permanent basis, with the dual goals of elucidating the role of a large coastal shark, and educating future generations of shark biologists in the difficulties of fieldwork. The past twenty years at the Sharklab have seen dozens of PhD and MS students, as well as hundreds of undergraduate and graduate volunteers from all over the world living and working together to further our understanding of these magnificent and critically important apex predators. Having already spent over twenty-five years researching lemon sharks prior to forming the BBFS, Dr. Gruber knew very well the islands of Bimini, and the important role they serve as a nursery for lemon sharks. Located just fifty miles (85 km) east of Miami, Bimini’s mangrove-fringed lagoons and tidal flats are ideal habitats for neonate (newborn) and juvenile lemon sharks. Every spring, around April and May, pregnant lemon sharks arrive in Bimini and give birth in the shallows to litters averaging 4-18 pups. 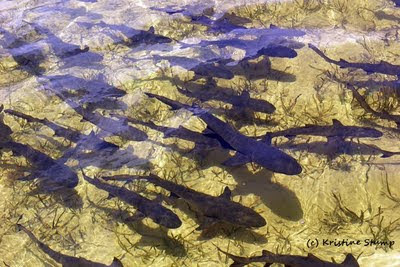 These new sharks will spend the next decade in the waters around Bimini, starting off in close proximity to the mangroves for the first four years or so before venturing out into the lagoon and flats as they grow larger. Eventually, as they near sexual maturity, they will leave Bimini, with only the mature females likely to return to give birth to their own litters. The males are much more nomadic and rarely return to their birth nursery. Thanks to the annual PIT Tagging Program, named for the type of tag used (Passive Integrated Transponder), the Sharklab maintains the largest and longest running mark-recapture and genetic database of any shark population in the world. The fishing, which is done with ~180 meter long gillnets made from a mesh of 20-pound test monofilament, is carried out in two major nursery areas, referred to as “The North Sound” and “Sharkland”. Gillnets are illegal in The Bahamas, but the lab maintains a research permit that allows their use (and we do so in a non-lethal manner). Each nursery is fished for six nights, with gillnets set at the same three stations each night. The nets remain in the water for twelve hours, a full tidal cycle, and are checked every fifteen minutes, with all captured sharks removed and transported to a fourth boat that serves as a tagging station. At the tagging boat, each shark is “worked up”, a process whereby each shark is sexed, weighed, measured, a genetic sample taken, and, if the shark is a new capture, given a PIT tag. The PIT tag is a small (rice-grain sized) radio-frequency ID tag that usually remains in the shark for the duration of its life and, if recaptured, allows precise and accurate records of that shark’s capture and work-up history. 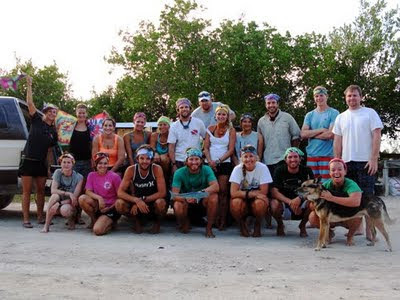 The Bimini Sharklab could not continue if it were not for our hardworking crew of dedicated volunteers. June 2011 marked the 17th annual PIT Project and, as with the sixteen years prior, it was an exciting but strenuous shark-filled month. The 2011 PIT crew consisted of twenty-two staff and volunteers from the U.S., England, and Switzerland, including Dr. Gruber, Dr. Bryan Franks, and Dr. Steven Kessel. Additionally, the Sharklab was thrilled to welcome our benefactor, Sundance Boat CEO Wally Bell and his daughter Alexis, whose generous boat, trailer, and motor donations make our work possible. The weather cooperated well, with a constant breeze keeping the mosquitoes at bay; and 2011 was the first in all seventeen years without a rainstorm! After twelve long and sleepless nights the totals are in, and they show some interesting trends. Sharkland, the first nursery to be fished, traditionally yields the most sharks of the two nurseries and is particularly hectic on the first night. This year’s catch, at 117 total (49 on the first night), is the lowest in recent years. Interestingly enough, neonates (newborn lemon sharks) constituted 56.4% of the total Sharkland catch, compared to last year’s 25.6%. Not to be outdone by Sharkland, the North Sound had a big year with 62 sharks caught on the first night and a nursery total of 92 sharks. Of the 92 North Sound sharks, 69 were neonates, with the remaining 23 being recaptures. As a result, more neonates were caught in the North Sound than in Sharkland, an unusual and interesting occurrence. The total catch for the 2011 season was 209 lemon sharks, a number about 10% lower than usual but still well within the range of variation. While the twelve nights of fishing during PIT may seem long and tiring, they are nothing compared to the twelve years, on average, it takes a lemon shark to reach sexual maturity. The slow-growing, late-maturing strategy, combined with relatively low reproductive output (fecundity), is characteristic of all sharks, not just lemons, and makes them highly vulnerable to over-fishing. If we as a planet are to successfully protect these apex predators, it is imperative that research such as that of Dr. Gruber’s Sharklab, continues to shed light on the life cycle of sharks. While the movement to protect sharks is there and the momentum is growing, conservation policies will only be effective if they are based on sound, empirical research. 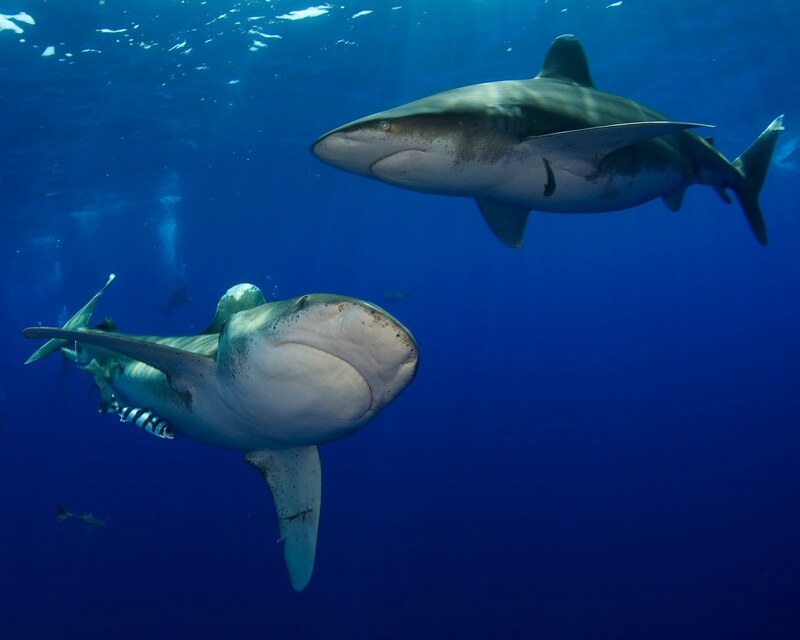 La Jolla, Calif.—Governments will soon have a chance to help conserve populations of oceanic whitetip sharks, which have declined so much in the eastern Pacific that catch numbers have been reduced to almost zero. Tuna fisheries are primarily responsible for the drastic decrease in population of one of the most prolific and widespread shark species, the oceanic whitetip (Carcharhinus longimanus). According to its own science, IATTC reports that overfishing of bigeye, yellowfin and bluefin tuna is occurring and that the exploitation rate of skipjack tuna, the most common variety purchased in cans, continues to increase. There are too many vessels. Current capacity surpasses IATTC’s limit by 33 percent, allowing an excess of 51 average-size purse seine vessels, which use large underwater nets, to go to sea. The Pew Environment Group is the conservation arm of The Pew Charitable Trusts, a nongovernmental organization that works globally to establish pragmatic, science-based policies that protect our oceans, preserve our wildlands and promote clean energy. www.PewEnvironment.org. We would like to commend The Bahamas National Trust for its sustained campaign for laws to conserve the valuable shark population in Bahamian waters. Due to the ban on longline fishing gear in the 1990s, Bahamian waters are one of the few places in the world with relatively healthy shark populations. The Bahamas is now one of the premier shark-watching destinations for divers, bringing in an estimated $80 million a year into the national economy. But even with the ban on longline fishing gear, sharks are still considered at risk in Bahamian waters due to other methods of fishing. Sharks are also especially vulnerable to overfishing as they are more akin to mammals like whales and dolphins, reaching sexual maturity in their teens, and then only have a few pups at a time. More than 40 different kinds of sharks can be found in Bahamian waters, including the whale shark, the great hammerhead and even great whites. There are currently no specific laws in The Bahamas to protect sharks. The Trust is now working with the internationally-renowned Pew Environment Group to raise awareness. The groups, along with other activists, are pushing for the government to enact specific laws needed to conserve the shark population. 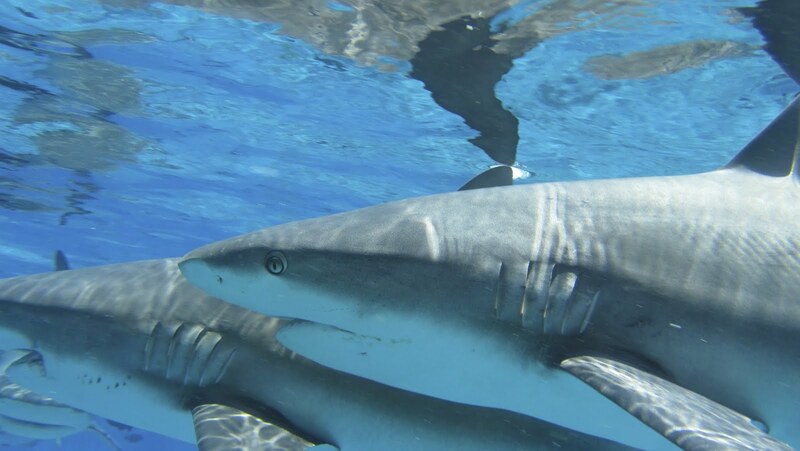 The Bahamian government is being urged to establish a shark sanctuary in Bahamian waters. It would be the first such refuge in the Atlantic Ocean, and would protect one of the richest resources in the world’s oceans. Worldwide, it is reported that up to 73 million sharks are killed every year, primarily for their fins. The Trust is working to gain permanent protections in all of The Bahamas’ Exclusive Economic Zone, an area encompassing approximately 630,000 square kilometers of ocean. Activists believe that by establishing comprehensive protections for these animals, not only will sharks be permanently safeguarded against other threats, but the health of the marine environment and the economy of The Bahamas will be conserved for generations to come. Bahamians have a loving fear of sharks. As top predators they help maintain the balance of oceanic food chains despite the overexploitation of fisheries. The Bahamas must put forth and enact shark conservation legislation before it is too late. The Asian appetite for shark fin soup, a delicacy served at many of their sacred occasions, is insatiable. It is not enough for us to publicly discuss and agree that shark fishing is detrimental to our waters and economy. Passing and enacting legislation provides an enforcement mechanism to hold any person not in adherence subject to the court of law. The sustained campaign by the Trust and outpouring of public support speaks volumes about the urgency of this matter. This issue goes far beyond political associations; it is for our country and our children’s country. Pew Environment Group's Jill Hepp presents Hondruan President Porfirio Lobo Sosa a photobook of sharks. 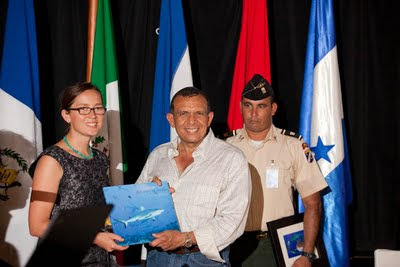 ROATAN, Honduras (24 June, 2011)—Honduran President Porfirio Lobo Sosa announced a permanent shark sanctuary in Honduran waters today, building on the country’s 2010 shark-fishing moratorium. The designation encompasses all 240,000 square kilometers (92,665 square miles) of the country’s exclusive economic zone on its Pacific and Caribbean coasts. President Lobo Sosa signed legislation that established the sanctuary at an event hosted by the Pew Environment Group on the Honduran island of Roatan. He also joined other government representatives from Central America to observe shark research off the coast. 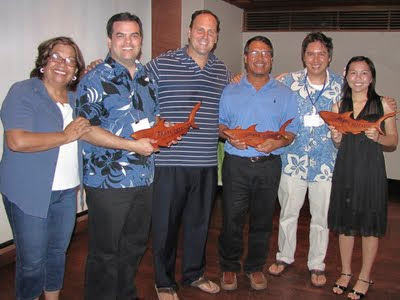 In September 2010, President Lobo Sosa joined President Johnson Toribiong of the Pacific island nation of Palau at the United Nations to challenge other world leaders to save sharks, stop the practice of finning and end global overfishing of the species. Palau established its shark sanctuary in 2009. El presidente hondureño Porfirio Lobo anunciará el viernes la creación de santuarios de tiburones en el Atlántico y el Pacífico, en cumplimiento a un compromiso que asumió el año pasado con la Organización de las Naciones Unidas (ONU), informaron fuentes oficiales. El mandatario hará el anuncio en Roatán, en las paradisíacas Islas de la Bahía en el marco de un taller que se instaló este jueves en esa región. La embajadora de Honduras en la ONU, Elizabeth Flores, explicó a periodistas en Roatán que "el presidente Lobo firmó en Naciones Unidas en septiembre del año pasado un compromiso de proteger al tiburón". El chileno Maximiliano Bello, jefe del Pew Environment Grupo de Conservación Global del Tiburón, dijo en el mismo taller que "hay 30 especies de tiburones, muchas de ellas migratorias (...) y el 30% están en peligro de extinción". "Estamos perdiendo los tiburones en el mundo", lamentó, y agregó que la mayor pérdida se da por el uso del aleta para la venta en países asiáticos. En ese sentido, Bello destacó la relevancia del proyecto del gobierno hondureño, mdeiante el cual se liberarán unos tiburones que han estado en cautiverio, los que estarán provistos de un chip para darle un seguimiento satelital a su desplazamiento. Resaltó que los tiburones son importantes en el ecosistema para mantener el equilibrio, porque sobre todo son depredadores de animales enfermos y hacen una limpieza en el mar. WASHINGTON—22 de Junio del 2011— Hoy, la Cámara de Diputados de Chile, ha aprobado de forma unánime, la legislación que prohíbe la práctica del aleteo en aguas del país. El proyecto de Ley tiene que ser revisado por el Senado del Congreso, antes de la aprobación final por parte del Presidente de la República, Sebastián Piñera y su posterior publicación. “La Cámara de diputados dio un decidido apoyo al proyecto de ley que busca acabar con el aleteo de tiburones. Esto, no solo es una buena noticia para los tiburones sino que también para todo el ecosistema marino más allá de la costa de Chile”, indicó Matt Rand , Director del Programa Global de Conservación de Tiburones del Pew Environment Group. “Demasiadas especies de tiburones se encuentran amenazadas en Peligro o Cerca del Peligro de Extinción. Celebramos que el Gobierno de Chile esté trabajando en revertir esta preocupante tendencia”. El aleteo de tiburones, que consiste en cortar las aletas de los animales y abandonar el cuerpo en el mar, hace posible que inmensas cantidades de aletas sean llevadas al lugar de desembarque en cada uno de los viajes de pesca. Las aletas son luego utilizadas como sopa, una comida asiática, considerada un lujo, que se vuelve cada vez más popular debido al crecimiento económico de los países de la región asiática. La legislación chilena obligará a todos los pescadores que capturen tiburones, a traerlos completos a puerto. Esta medida facilita el monitoreo y por ende el cumplimiento de la misma. Esta regulación se diferencia de otras en que permiten traer los tiburones de forma separada, cuerpos y aletas, donde estas últimas deben corresponder a una proporción del peso total del animal (normalmente al 5%), sin embargo este sistema es complejo y difícil de cumplir, no así como la medida de las aletas naturalmente adheridas que ha adoptado Chile. "La votación de hoy demuestra nuevamente el gran momento que se vive en la conservación de tiburones a través del Pacífico,” indicó Rand. “Chile se unirá así, al esfuerzo de Estados Unidos, en sus territorios de ultramar como Guam y las Islas Marianas del Norte, así como también a la República de las Islas Marshall, todos los cuales han tomado acciones concretas para proteger estos animales en los últimos seis meses. Sin embargo, más países se necesitan para poder proteger a los tiburones en todos los océanos." El Pew Environment Group es la rama de la conservación del The Pew Charitable Trusts es una organización no gubernamental que busca establecer decisiones políticas pragmáticas, basadas en la ciencia para la protección de nuestros océanos, preservar zonas naturales terrestres y promover el uso de energía limpia. WASHINGTON—22 June, 2011—Today, the Chilean Chamber of Deputies unanimously passed legislation that bans the practice of shark finning in Chilean waters. The Senate must approve the current version of this bill before it moves to President Sebastián Piñera for his signature. Shark finning, which entails slicing off the fins and discarding the body at sea, makes it possible for vast quantities of fins to be brought to port in one fishing trip. They are then used in shark fin soup, an Asian delicacy that has become increasingly popular with expanded economic growth. 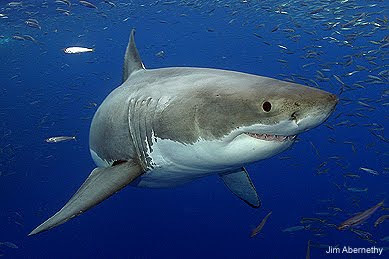 The Chilean legislation would require that any fisherman who catches a shark brings it to port intact. This is easier to enforce than the bans in some countries and fishing treaties, which allow fins and bodies to be brought to port in separate piles. For enforcement, the weight of these piles is compared to make sure they are in proportion—generally fins comprise five percent of the shark’s total body weight—but this comparison is complex and can be more difficult to enforce than mandating that fins be naturally attached, as in Chile’s new ban. The Pew Environment Group is the conservation arm of The Pew Charitable Trusts, a non-governmental organization that works globally to establish pragmatic, science-based policies that protect our oceans, preserve our wildlands and promote clean energy. Pictured from left to right: Pew Ocean Commissioner Carlotta Leon Guerrero, Guam Senator Rory Respicio, Pew Global Shark Conservation Director Matt Rand, CNMI Representative Diego T. Benavente, Pew Senior Associate Angelo O'Connor Villagomez, and recent graduate of Simon Sanchez High School Evelyn Quiel, President of Sharks MADE. WASHINGTON—22 June, 2011—The Association of Pacific Island Legislatures (APIL) issued a resolution last week stressing the need for additional actions to protect sharks. MAJURO — The Marshall Islands Marine Resources Authority is drafting legislation to control currently unregulated shark finning and sea cucumber harvesting in this north Pacific country. The goal, said fisheries Director Glen Joseph, is to have the new legislation ready for introduction to the Marshall Islands parliament at its August session. The fisheries department imposed a ban on shark fishing and sea cucumber harvesting earlier this year over concern about the level of unregulated exploitation of shark fins and sea cucumbers. Because the August session is the last before the November national election, the fisheries department is keen to get the legislation introduced and passed before the election recess, Joseph said. One of fishery department¹s aims is to reduce the amount of shark “by-catch” that longliners get when fishing for tuna. This can be accomplished in part by requiring improvements to fishing gear used by longliners, he said. The Northern Mariana Islands banned the sale, trade, and possession of shark fin on January 27, 2011. The bill was introduced by Representative Diego T. Benavente and was supported by a number of fishermen, divers, and environmentalists, as well as a number of international shark conservation organizations including Shark Savers, WildAid, and Humane Society International. Kathy Pagapular, a teacher on Saipan, first saw the film Sharkwater at American Memorial National Park, which hosts a free public showing of an environmental movie on the first Friday of each month. She liked the film so much, she purchased it off Amazon.com and showed it to her sixth grade class. 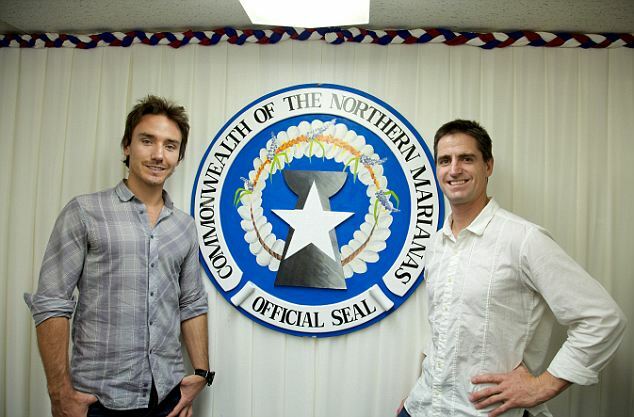 The students loved the movie, too, and decided to write to Sharkwater's director and editor, Rob Stewart, to ask him to come to Saipan to help them protect sharks. Sharkwater Saipan picks up the story from there. WASHINGTON — Shark defenders hope to capitalize on a series of victories in their fight against the lucrative fin trade, releasing a report Monday calling for sanctuaries to save the world's oldest predator. As legislation inches forward in California to ban the import and purchase of fins used in gourmet Chinese soups -- source of the global shark population crash -- activists are pushing for a sanctuary in the Bahamas in a bid to halt drastic overfishing that sees 73 million sharks killed each year. "We've begun removing them from the oceans at an unprecedented rate in their 400-million-year history," Global Shark Conservation at the Pew Environment Group (PEG) director Matt Rand told AFP, as activists heading the conservation movement convened in Washington last week for a strategy meet. "They predate dinosaurs by about 100 million years, and somehow survived the extinction that killed those creatures. But they're not surviving the situation they're in today. All for a bowl of soup." Hunger for their fins has exploded with the growing practice of "finning" -- hacking off fins from the live animals and throwing them back in the water to die -- responsible for a 90 percent decline for some species. Some 30 percent of all shark species are immediately threatened or near threatened with extinction, according to the report. The sharks' own biology make them especially vulnerable to overfishing as they are more akin to mammals like whales and dolphins, reaching sexual maturity in their teens, and then only have a few pups at a time. Activists hope to replicate Palau's success story. In a landmark 2009 move, the Pacific territory became what Rand called a "preeminent champion" in shark conservation, as the first nation to declare its waters -- about the size of Texas -- a shark safe haven. The Maldives followed suit a year later, and Honduras has a moratorium on finning. But if the Bahamas resolves to make such a commitment, Rand said, its wealth of sharks and dedicated shark tourists could make it the "crown jewel of shark conservation in the Atlantic." Financial reasoning is a key weapon in the defenders' arsenal: according to a Pew-commissioned study released last month, a single reef shark can be worth nearly $2 million in tourism revenue over its lifetime. In the Bahamas, similarly, the shark diving industry is already worth some $80 million a year, a figure likely to rise if a sanctuary is imposed, said Bahamas National Trust Council executive director Eric Carey. The payoff appears fruitful, but fishermen who have seen their regular fish stocks decline in recent years have been particularly receptive to raiders of the pervasive fin trade who reach out to communities wherever sharks are found, touting the fins' high value at around $700 per kilo. In California, the ban moving through the state house builds on the US Shark Conservation Act, signed by President Barack Obama in January, which clamps down on finning. The measure is seen as strongly backed by California voters, but has divided the West Coast state's Asian-American communities. It's seen especially stiff opposition from lawmakers with strong Chinese constituencies, where the practice is defended as a tradition, and the proposed law slammed as an attack on heritage. "Shark fin soup is considered an honored traditional delicacy and is served at many of our sacred occasions," Fiona Ma, a San Francisco Democrat, told The San Diego Union Tribune. The effort to stem the biggest demand -- from the Chinese mainland, and Hong Kong -- is a key aim for the movement. Just how to do that, though, remains a major question. "If the dynamics of the trade are not changed quickly, we will lose many species of sharks within a generation," Rand warned amid the days-long strategy sessions in Washington last week, where the Pew group was joined by dive shop owners and ecologists from around the world. In a rare boost for activists from within the Asian giant, billionaire delegate Ding Liguo at the National People's Congress proposed a shark fin trade ban earlier this year in the face of huge opposition. In a bid to shift in opinion there, he insisted "only legislation can stop shark fin trading and reduce the killings of sharks." Saving the top marine predators means "using this growing momentum," according to Karen Sack, Pew Environment Group's director of International Ocean Conservation, who urged the visiting shark activists "to keep bringing it to the desks" of those in a position to affect change. 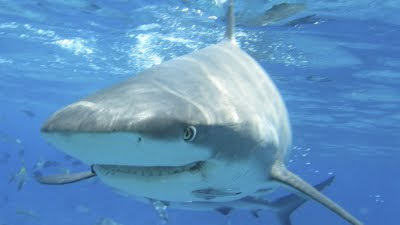 Become a fan of Hector the Blue Shark on Facebook.